Henk Offereins DVM MVSc, Proprietor; DVM University of Utrecht, The Netherlands, Qualified Equine Practitioner Royal Dutch Veterinarian Association. Henk was practically born and raised in a Veterinary Hospital. He learned the profession 'at his mother's knee'. "My grandfather was a vet since 1918 and my father since 1956. I graduated in 2000 and worked as a vet in Maastricht (NL). I have always been interested in animals, and in my spare time I like to spend time with my family and our animals (horses 'Santana", 'Rocky" and 'Ollie", dogs “James”, “Snoopy”, “Shadow” and “Pearl” the cat). In 2005 Henk set up Kenmare Veterinary Centre together with his wife Joanna Offereins (RVN). The Centre has since developed in to a local focus for everything that has to do with veterinary care, animal welfare, supplies and advice. The centre is proud to be a registered equine and small animal Hospital as accredited by the Veterinary Council of Ireland. Kenmare Veterinary Centre offers a mobile service in the greater Kenmare area. Henk also enjoys being a international sport medicine vet for horses, greyhounds and working dogs. Sport medicine clinics are currently held all over Ireland, Holland and South Africa. Dr. med. vet. Carina Mederle MVDr; Qualified in 2012 at Ludwig-Maximilians-Universität München (Munich, Germany) Carina went on to do a Doctorate about laminitis in Thoroughbred horses, which she finished January 2015. Her main interests at work are horses and small animals, and nutrition in dogs and cats. After work she enjoys horseback riding, and taking part in dog Agility-Trials with her dog Jackie. Joanna Offereins RVN; Together with husband Henk Offereins DVM, MVSc, Joanna started and runs Kenmare Veterinary Centre. Joanna graduated as a fully qualified human nurse in 1997. Since 2002 she has been working as a veterinary nurse and has received the title of Registered Veterinary Nurse in 2008. A lot of practical experience, personal contact with clients and an enormous amount of dedication is what she stands for. She has also followed the course for pet health counsellor and runs weight loss clinics and is there to answer most questions about our food range. After work Joanna spends her time with her 3 children dogs and horses. Susann O'Sullivan-Daly RVN; Susann a registered Veterinary Nurse since 2012. She has worked at our centre since she was a student in 2008 and is responsible for stable management and nursing of our in-patients. 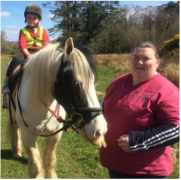 Susann is very much involved in farming as she comes from a farming background and in animal welfare as she spent a number of years working with rescues and has rescued and treated a tremendous amount of animals in sometimes very difficult circumstances. After work she likes to take her 3 rescue dogs for a walk and she also enjoys horseback riding. She owns 2 horses that came from bad circumstances!! Bernadette Bates RVN; Bernie is our registered small animal veterinary nurse. She has worked in veterinary practice since 1999 (both in England and Ireland), and before that she worked for Wood Green Animal Shelters in the UK for 10 years. In 2005, she was nominated for “Pet Plan’s Nurse of the Year Award”. Her main job here is to provide first class care for your pet while in our hospital. Additionally, she has a special interest in small animal behavior problems and has certificates in both feline and canine behavior. She is a great source of advice for problems that occur with your pet. Bernie has also trained in the UK as a puppy class instructor and is happy to offer one to one tuition in your own home or here at the clinic. Scott Rawson, Clinic Assistant: Scott is our General Clinic Assistant. He has worked at our clinic since it first opened in 2006, and along with Henk and Joanna is our longest serving member of staff. Scott is often the first point of contact for our clients, and will always try to answer any of your questions! Scotts background is in horses as he ran his own riding stables for a number of years before joining our team. His interests outside work include breeding and training young horses and spending time with his family and their pets. Toni O'Sullivan, Accounts; Many years of accounting experience and a tremendous love for animals brought Toni to us. Toni was one of the founding members behind our local animal welfare society, KLAWS. We offer the unique facility of direct debit payments for unexpected high bills and for ongoing veterinary care. Toni will be your contact regarding this service and all other accounting matters in our centre. Robert Dusoswa; Robert is a hardworking member of our team, helping clean the stables and yard in the mornings, and looking after many different jobs, from doing the laundry to making the coffee! We always have a number of Veterinary and Veterinary Nursing students on placement during their studies. These students come from all over Europe improve their studies and work with the team in Kenmare Veterinary Centre.